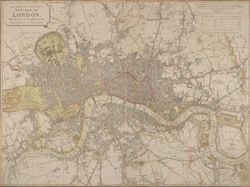 The title of this map of London and suburbs appears at top left, with the key to symbols and abbreviations at the top right and a compass rose at the bottom centre. The map is divided into mile squares with borders marked off in furlongs for reference. Squares, open spaces and city boundaries are distinguished in colour. This is a later edition of a map first issued in 1804, updated to include the new bridges and the approaches at Waterloo and Vauxhall (indicated by dotted lines). Built between 1809 and 1819, Vauxhall, Waterloo and Southwark bridges were projected, funded and constructed by private commercial companies hoping to profit from toll-paying traffic from Lambeth, Camberwell and the rest of south London.